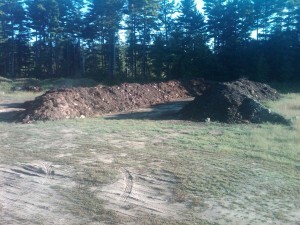 With over 1 acre of our pit dedicated to composting alone, we always have fresh compost ready for your use. This material is composted from recycled yard waste (leaves, grass clippings, shrub clippings, etc.) and has no plastic or other foreign material in it. It is screened down to ¾” and is great as an additive to our screened loam for plantings. Two windrows of compost in the decomposition process. The one on the right is almost done and ready to be screened. Residential Sitework | Commercial Sitework | Roads & New Development.